Hi foodies...Welcome to AYESHA'S KITCHEN. Do you love pasta?? And do you love pizza flavored pie??? 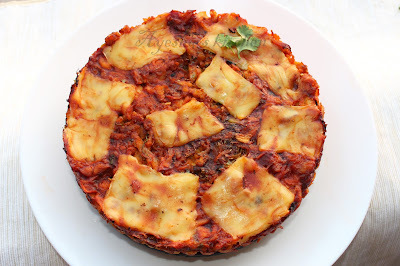 So how about a Pasta pie..? 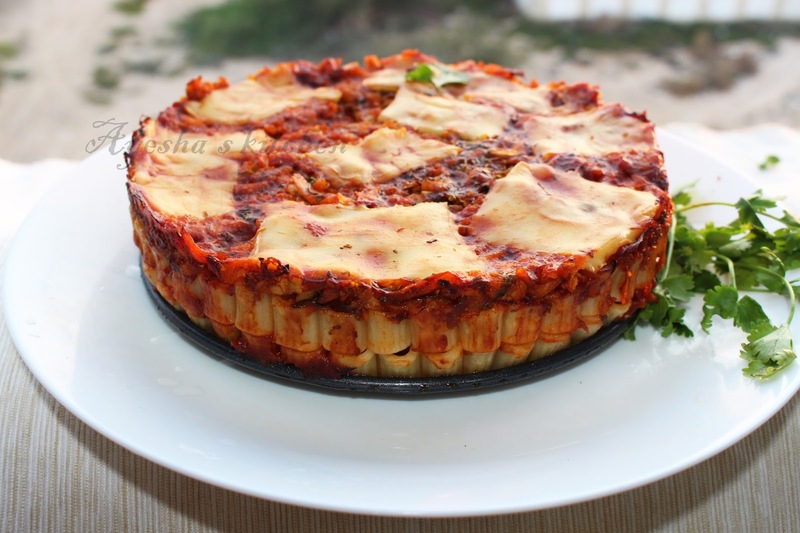 Yes, Today's recipe is a yummy pasta pie / Rigatoni pasta pie. Pasta rigatoni, a tube-shaped pasta of varying lengths and diameters. The word Rigatoni comes from the Italian word rigato which means ridged. It is the favorite pasta shape in the south of Italy, especially in Sicily. It looks impressive and tastes unique. Isn't it one of the attractive pies ever? I was in a worry that how it would actually stand, once the springform is released. But it totally worked and came out perfect. As am a lover of baked pasta and cheese, this baked rigatoni recipe inspired me to try more often. The part of arranging that pasta is time-consuming but its worth enough for impressing your guests. For this pasta recipe, all you need is a springform pan only and the rest is common ingredients available in most of our kitchen. A very simple and appetizing snack. Here is the recipe showing how to make macaroni pie / amazing snack pasta pie/spaghetti pie/rigatoni pasta pie/rigatoni pasta recipes. Cook the pasta in a large pot of salted water and 1 tbsp oil for 10 minutes. Two cups of pasta should be cooked in 4 cups of water. Or as per the directions were written on the packet. Always use a big pot so that pasta will not stick to each other. When done, rinse it with cold water and drain it. Coat it with 1 tsp of olive oil (optional only). Set aside. Mix some 5 tbsp grated creamy cheese with egg and make a fine paste. Set aside. Now we have to prepare the chicken masala. Heat 1 tbsp oil in a pan and toss the shredded chicken well. Add sliced carrot, minced garlic and salt to it. Do not add more salt. Saute well and then add the tomato puree to it. Cook well until it thickens. Mix well and add 1 tbsp of pizza sauce for a nice flavor only.. Set aside. Now toss the cooked pasta with 2 tbsp of grated cheese. Then butter a springform pan. Thickly pack the pasta into the pan, standing each piece close to each other as in the pic. Spread on the top the cheese with egg batter and push half of this batter into the pasta holes filling each one up. Again pack the pasta into the pan as a second layer. If you are using long pasta, then one layer is enough. Then spread the chicken tomato masala over it, filling the holes. Pour the remaining cheese egg batter on the top. Sprinkle some oregano. 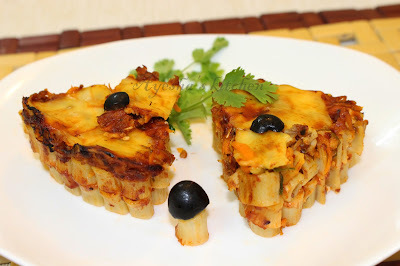 Garnish with some cheese slices. As we are using salted cheese, be careful in adding salt to the masala. Place it in a preheated oven and bake for 15- 20 minutes at 180 degree C until cheese is golden. Remove from oven, DO NOT UNMOLD NOW. Let it stay for 15 minutes and then run a knife around the edge to loosen and then unmold.